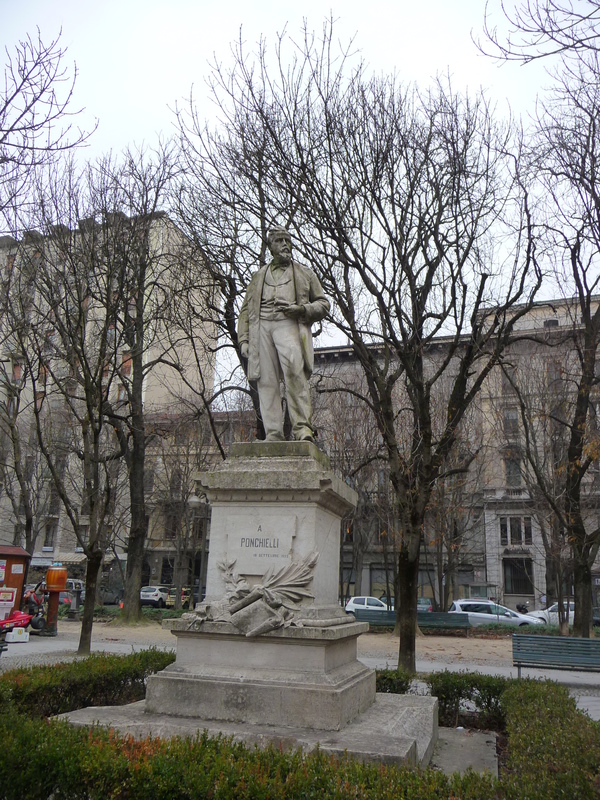 One hundred years ago Milan had a popular Expo when the city was in the forefront of the industrial boom and on its way to becoming Italy’s capital of finance. A century later and it is preparing for Expo 2015 but it can add to these attributes the fact that it is now an international centre of design and fashion to rival Paris, New York and London: and with 191 foreign communities in the city it can be considered one of the most cosmopolitan in Europe. 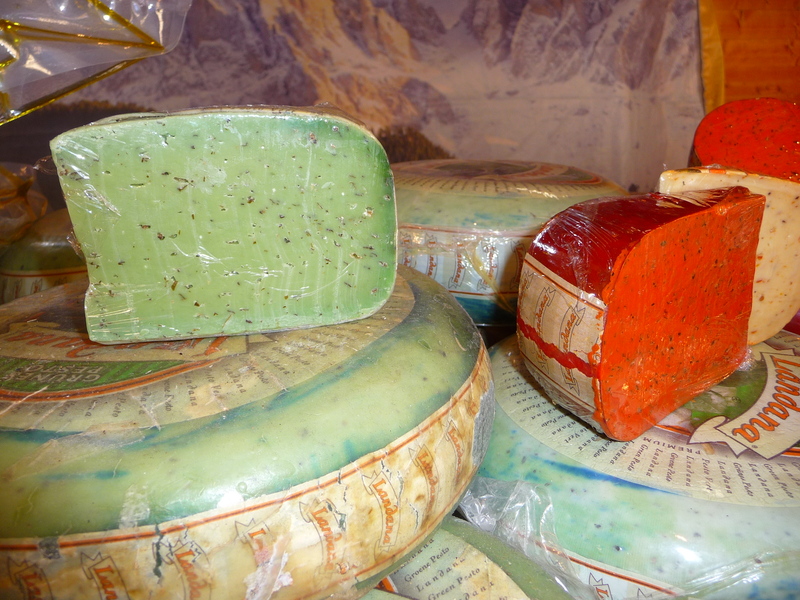 I’ve just recently returned from Lombardy where the preparations for the upcoming Expo 2015 has the region in a whirl. It will be big, Big, BIG! and it is already attracting unprecedented attention. With one and a half million tickets to the Expo already sold to China, something tells me this is going to beat not only the 1915 Expo but all the others in between. The site for Expo 2015, which is located on the outskirts of Milan, is themed around sustainability and the desire to guarantee everyone in the world a healthy, safe and adequate diet. To this end, many of the Pavilions will be devoted to food that lends itself to this idea and will give Lombardy a chance to show off its rich and fertile land and the produce that the region produces. Entertainment in many forms is planned but perhaps the most spectacular will be the world famous Cirque du Soleil which is creating a unique show of music and dance taking its cue from “Feeding the Planet, Energy for Life” and which will explore and celebrate the elements of culture, tradition, innovation and their relationship with food. Presented nightly, from May 6th to August 23rd, Allavita! will be performed in an open air theatre with a cast of over 50 Italian and international artists. 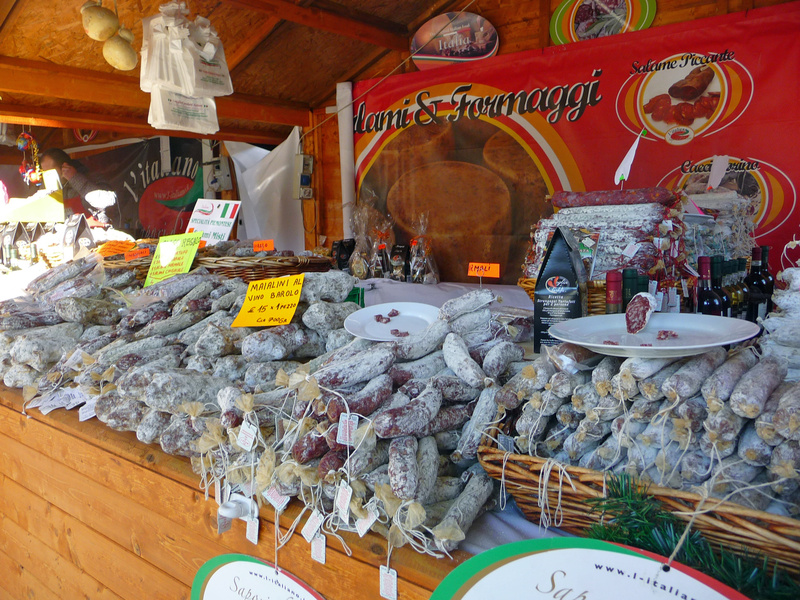 Of course Lombardy is going all out to showcase its beautiful towns and cities but these need little introduction to those who love food and fashion. When you think fashion you think Milan, the fashion capital of the country. 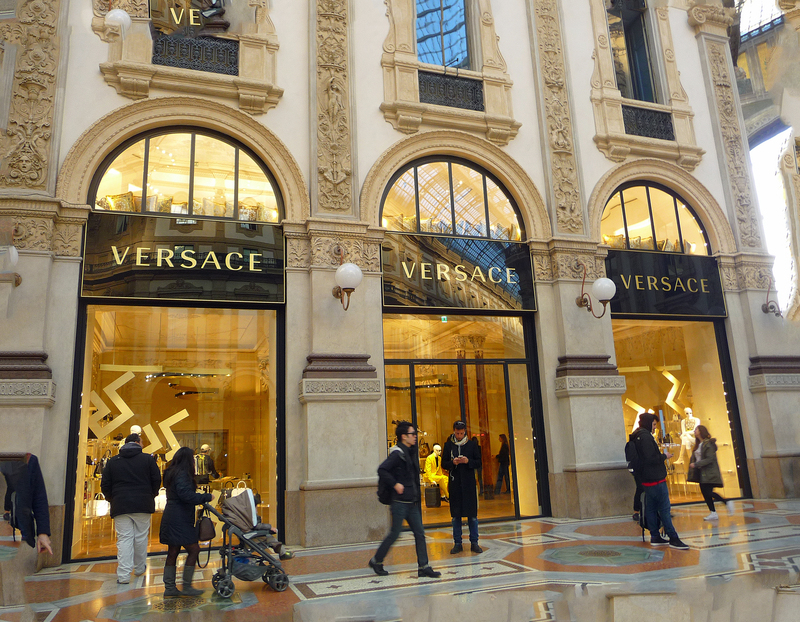 A walk through any of the chic areas like Brera, or through the exclusive boutiques located on the Via Montenapoleone and Via della Spriga,and in the magnificent Galleria Victor Emanuele by the Duomo is an experience dear to the hearts of all fashionistas. Lombardy’s fine foods and wines stem from the richness of the countryside and the husbandry of the land over many centuries.The feast of flavours that is risotto, osso buco and the casserole dish, cassoeula, accompanied by any one of the 42 wines bearing DOCG, DOC or IGT denomination and superb cheeses such as Taleggio, Pavano, Povolone and Gorgonzola will satisfy the most demanding bon vivant. Even snacking on antipasti dishes of salami and Parma hams dressed with local olive oils or their special oil flavoured with almonds, is guaranteed to impress. 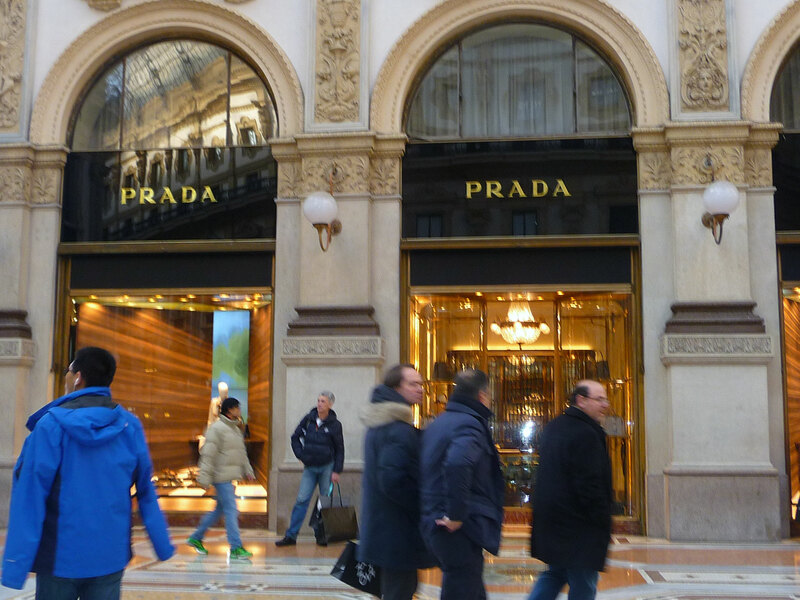 Nor does Milan rely only in fashion and food to keep its visitors happy. That world renowned temple of culture, La Scala Opera House with its seasonal repertoire of ballets, operas and concerts, has just had an upgrade and now its acoustics and level of comfort rival any major opera house. For more experimental performances, film festivals and lectures, the first permanent theatre in Italy, the Piccolo of Milan which is an institution in itself, is where it all happens.. The immense Gothic Duomo of Milan deserves that must used and abused word, awesome, and if you take the lift to the first roof and the winding steps to the top from there, the view is magnificent. Stories of its construction are legendary but experts agree that work on it started round about 1386 and continued until the 19th century, leading to the phrase for a long awaited item “took as long as the Duomo”. 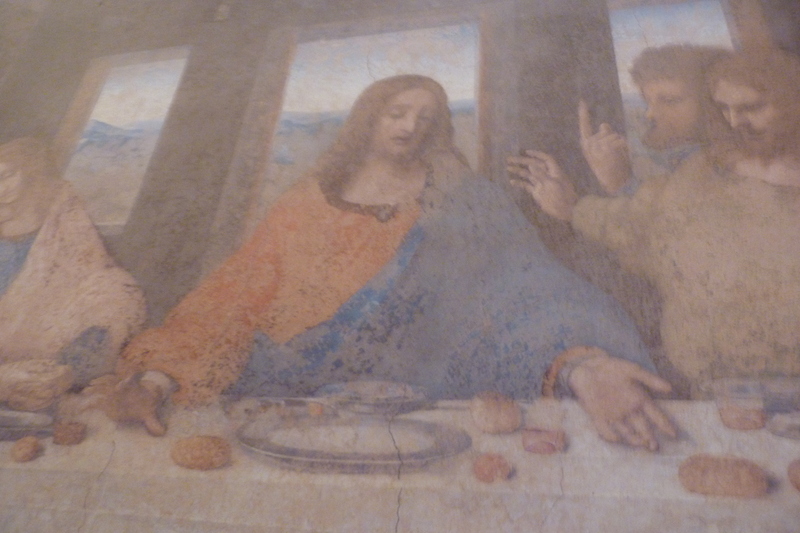 It’s a cliche I know, but one has to say that the jewel in Milan’s crown is undoubtedly Leonardo da Vinci’s The Last Supper, the exquisite fresco that even in its faded state, has a glory and a grandeur that draws one in to the scene. This fresco is housed in the refectory of the Renaissance gem that is the Convento of Santa Maria delle Grazie. Leonardo spent more than 20 years in Milan and there are various spots around the city which have connections to him, one being the innovative system of canal locks at the Alzaia del Naviglio Grande which were the first examples of hydraulic engineering in Lombardy and were partly conceived by him. 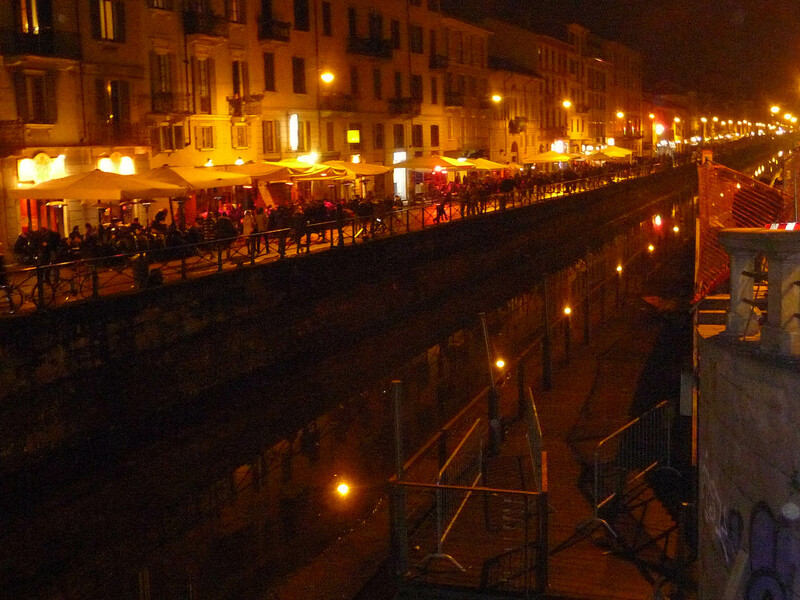 Worth visiting at night for the party atmosphere – BoHo Milano as it’s called – this area from dusk till after midnight is a world of party people strolling along canals lit by sidewalk lamps and the neon signs of the bars, cafes and restaurants that line the waterside. 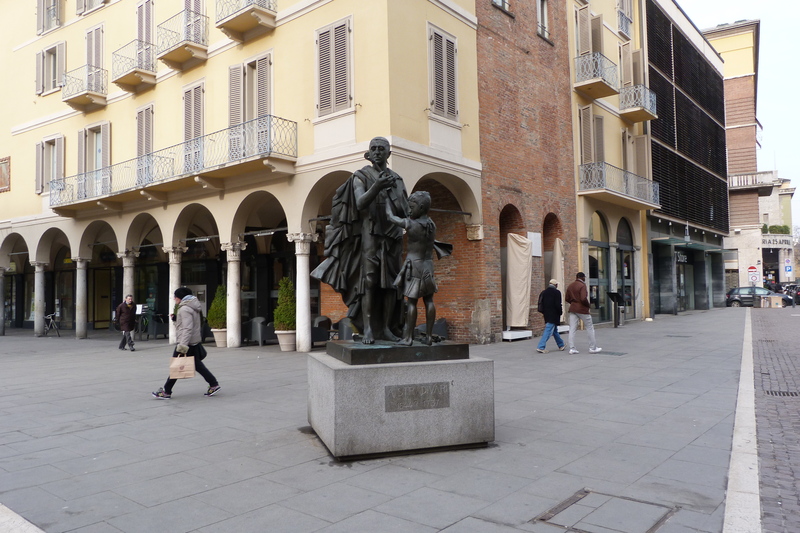 Not far from Milan is Cremona, the cultural centre of Lombardy and important in Italy’s cultural life since Roman times. The narrow streets of the city are rich in history, the red brick medieval towers and the Renaissance buildings offering shade to the grateful Cremonese during the heat of summer. It is also the birthplace of the violin, the most famous centre in the world for the production of stringed instruments since 1566, when Andrea Amati invented the instrument based on the medieval viol. His grandson, Nicolo Amati, and his pupils Antonio Stradivari and Guiseppe Guarneri, then went on to make the best violins in history, but it is to the violin master of all time, Antonio Stradivari (1644-1737) that the city owes its fame. 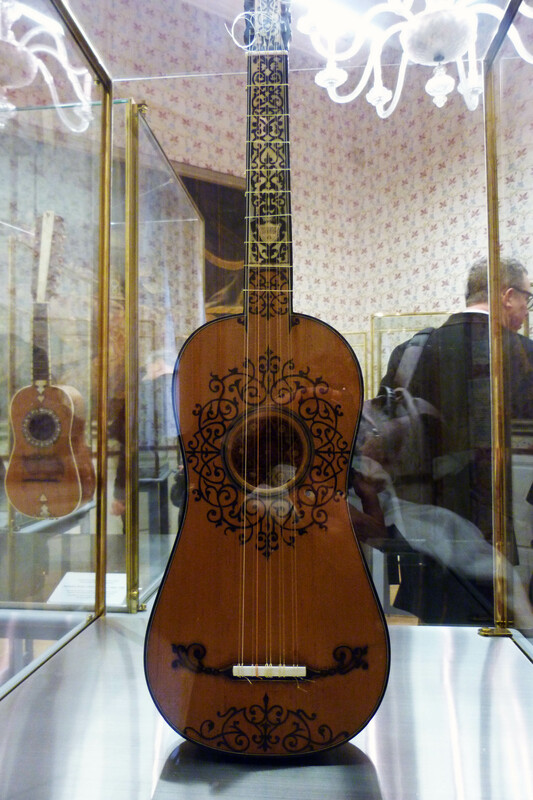 The great man is reputed to have made 1,100 stringed instruments, mostly violins, over half of which are still in existence and which today sell for millions of dollars – when they come on the market. 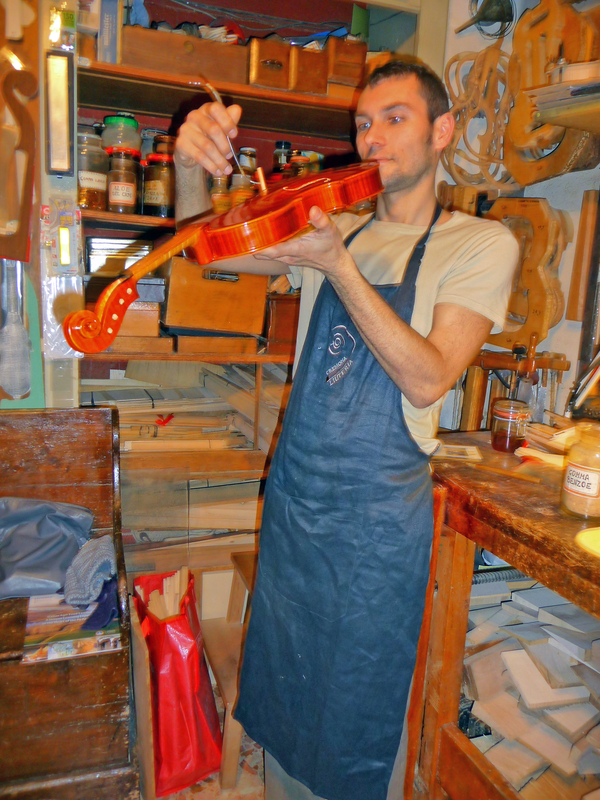 Luthier Stefano Conio of Cremona, demonstrates his craftmanship. The heirs to the great masters are today alive and well and I was lucky enough to be invited to visit the studio of one, Stefano Conia, a 42 year old master violin maker as was his father and grandfather before him, and I watched as he shaved the wood, varnished the violins and mixed the glues for instruments he was working on. Most luthiers produce only 10-12 instruments per year, most being commissioned and costing upwards of £12,000 each. Opened in 2013 this exhibition and concert hall is a stunning venue, displaying the magic and mystique of the stringed instruments in walk through sections that display the history of the violin. In the Museo Civico there is a world-renowned collection of more than 60 stringed instruments, early guitars, mandolins and lutes, the beautifully decorated violins of Amati and the inlaid masterpieces of Stradivari in ten rooms each one dedicated to a specific period. On most days one can hear a short performance played on one of the violins from the collection by one of the young musicians from the Foundation, musicians at the very top of their profession. To hear Meditation from Thais by Massinet played on a 1727 Vesusius Stradivarius as I did, is something just short of magical. In the streets and piazzas you will find links to both Cremona’s commercial and cultural past, whether it’s the bronze statues of Stradivari in the Piazza of the same name, the house in Corso Garibaldi where he lived and worked from 1667 to 1680, the replica of his tombstone in the Piazza Roma, or the statue to the equally famous Claudio Monteverdi in Piazza Lodi. Moneverdi, born in Cremona in 1576, wrote one of the world’s first full-scale operas, L’Orfeo, in 1607 and received his first musical training at the Duomo which no one visiting Cremona should fail to visit. 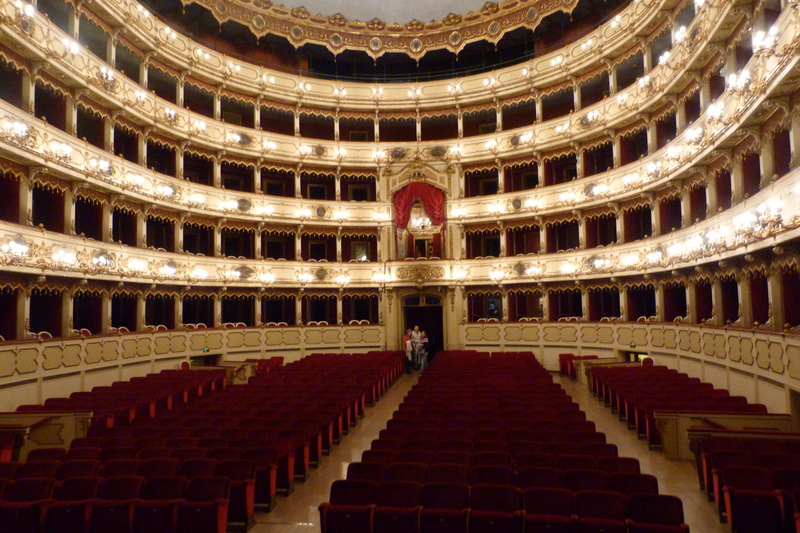 The XVlll Ponchielli Theatre, only the third opera house to be built in Italy was named in honour of the Cremonese operatic composer Ponchielli who wrote his first symphony at the age of ten. Best known today as the composer of La Giaconda (Dance of the Hours) which as well as being a well-known ballet featured in the Disney film Fantasia half a century ago. If it’s summer there is lots to do on the river, boating, excursions, canoeing etc., and if you have a few days to spare you can rent a floating houseboat and go right down to Venice, or next door to Padua for instance. Expo 2015 will bring many more tourists to the towns and villages surrounding Milan – Cremona, Mantua and Padua. The food in this part of Lombardy is particularly wholesome and the slow-cooking revolution is growing fast. Hotels are plentiful and good but special mention should be made of the Agriturismo movement which has thrown up some superb b & bs in and around the towns where the food is produced, usually organically, on the farm stay. 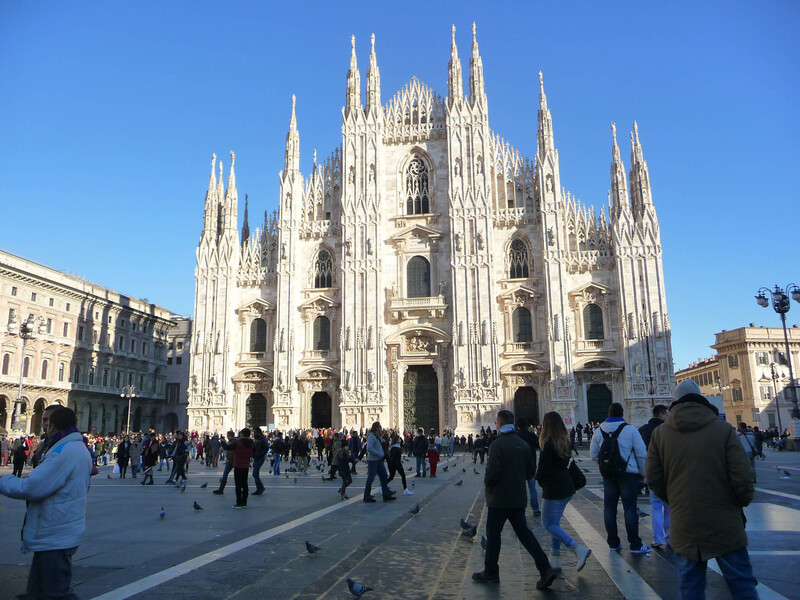 The official tourist website of Milan and Lombardy containing information, updates, descriptions, images and videos about the beauties of the area,as well as a range of proposals of travel, accommodation and services offered by Lombardy. Welcome to Italy! 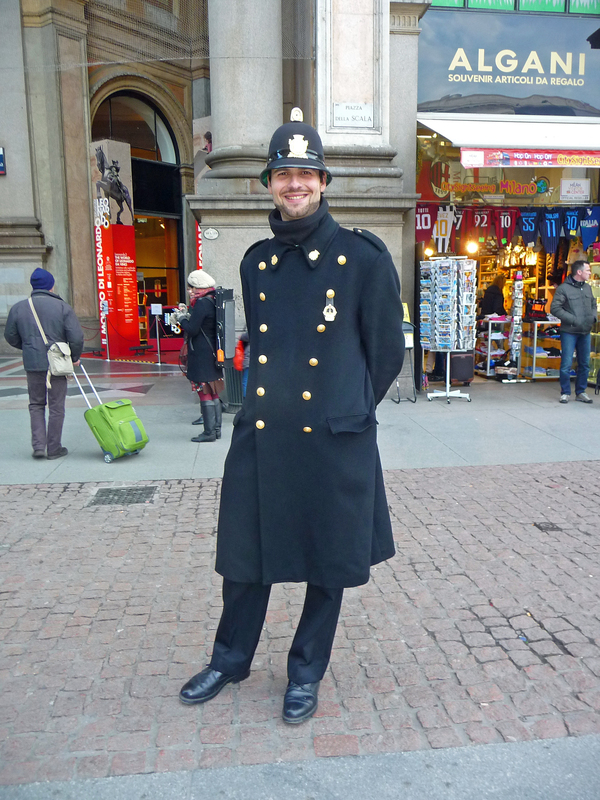 The Smiling Policeman. AS always with Mari Nicholson’s work I am transported to the place, the ambiance and its people. She gets beneath the superficial tourist hot spots to the essence of the place, wherever she is. More please. Thanks, Jan. It is easy when one falls in love with a place and I’m lucky to enjoy my travels and to be able to choose the places I really love. Thanks! Great post! My wife and I are headed to Milan in September! I used to work for an airlines and travelled extensively in my 30s. I am now settled with kids and in a job that pays a little bit more than peanuts. But I miss the travelling. Thanks for introducing me to Milan. One of the cities that I unfortunately did not get to visit. You’ll catch up with Milan when your kids are grown up and off your hands (no, don’t despair, it will happen one day, honest, I promise). Love your posts but wonder how on earth you find time to write so many. I thought you were a Dublin man of leisure and now you tell me you work! Ruined my image of you.